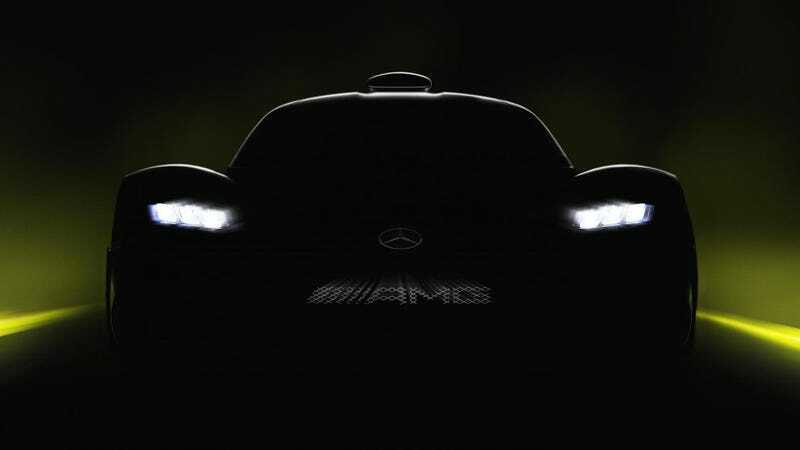 The Mercedes-AMG hypercar gives a whole new definition to the word, because it’s been more hyped than Taco Tuesday before the world was supposed to end in 2012. Mercedes said the road car with a Formula One engine in it makes more than 1,000 horsepower, and that its top speed will “exceed” 217 mph. Eh, OK.
Mercedes announced the top speed Friday along with the “Project One” car’s debut, which will be at the Frankfurt Motor Show in a couple of weeks. The car will surely be cool and all, but the top-speed stats Mercedes tossed in there were a bit underwhelming if it doesn’t “exceed” 217 mph by... a lot. The thing is, it’s kind of silly to say that. You’re not going to pass a speed-limit sign in a rural desert that says “IDK, do whatever you want,” so paying $3 million for 1,000 horses and 217 mph seems like a huge, silly waste of money for nothing other than the Instagram props and the occasional track day. It feels that way with any ridiculous supercar that’ll never let you reach its full potential in daily life. Anyway, we’ll see Mercedes’ wild-but-maybe-not-as-wild-as-we-thought F1 car for the road later this month. Hopefully it’ll look cool.